- Pre-heat the oven at 400 degrees F.
4. 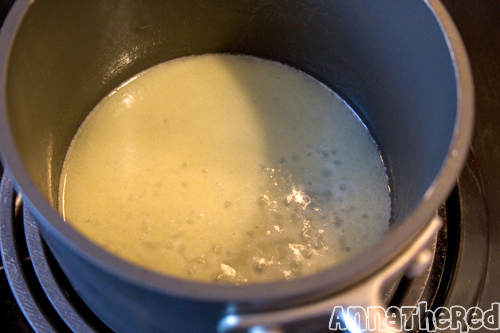 Keep checking the texture as you add a TBS of beaten egg at a time. 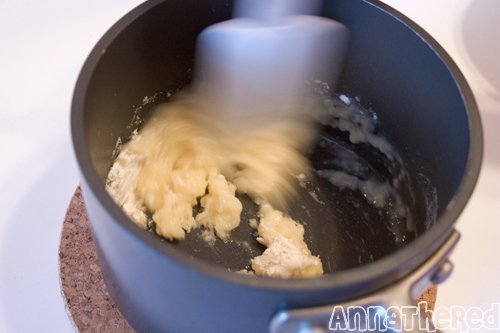 The dough is ready when the dough is thin enough that when you scoop the dough up, a lump falls after 3~5 seconds, making a triangle shape from the spatula. Tips: Each oven is different. 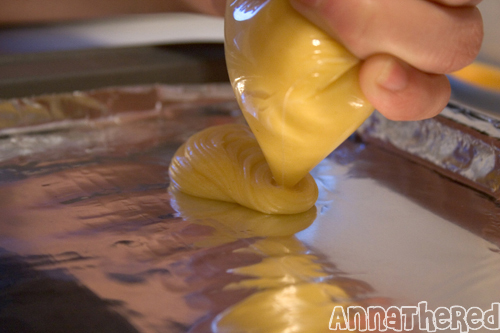 So I suggest you keep peeking inside the oven while you bake. If the dough is puffy and golden brown, it’s done. 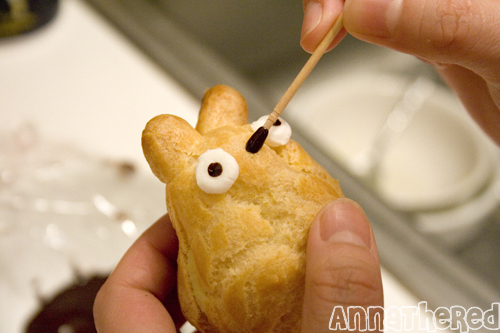 Tips: I’ve tried Eyes A a couple of times in my previous Totoro cream puffs, but after experimenting, I recommend Eyes B for beginners.Â They both look pretty much the same from the front. (You can see a picture of Totoro with Eyes B from front on my flickr) The only thing is that you can’t make very small eyes with Eyes B method. 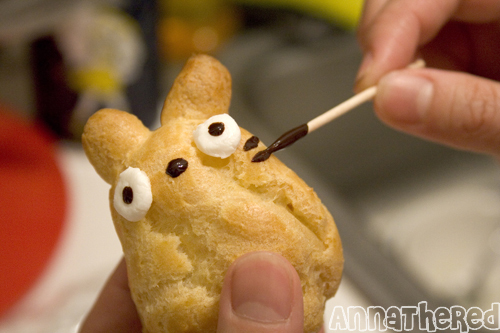 For Chibi-Totoro, dust with powder sugar using tea strainer BEFORE you put eyes on.Â For Chu-Totoro, dust with powder sugar first, and cut paper for the stomach part and put it over a puff and dust with green tea powder BEFORE you put eyes on. 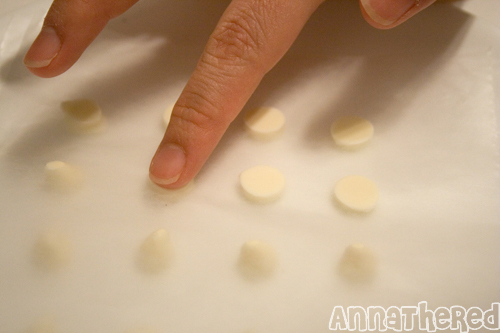 Now watch them disappear in less than a minute! mI’ve been baking almost every night for couple of nights straight for this how-to, and after I make them, I just take them to work and give them away. 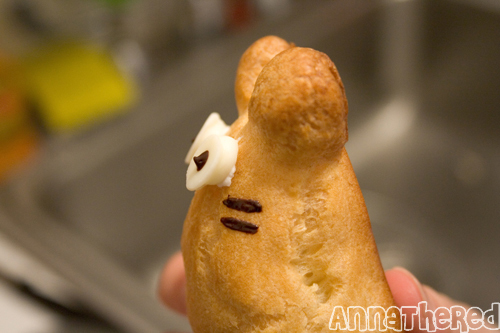 I’m very glad that all my co-workers like Totoro, like sweets, and love sweet Totoro even more! 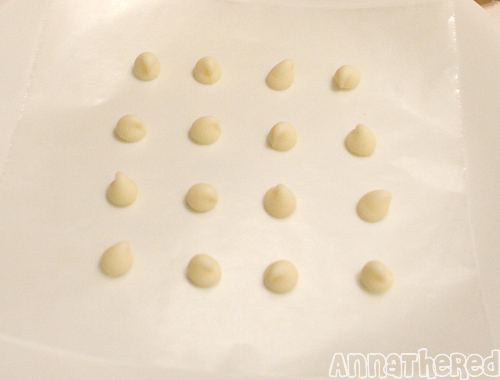 The instructions may seem really long but I just wanted to explain every step as much as I can, especially for those who never made cream puffs. It’s really not as hard as it looks.Â If you don’t want to make too many Totoro, you can use the half of the measurements to make half the amount.Â Actually, I’ve used the half of the measurements for the first couple of times, so that I could practice and ‘get to know’ my new electric oven. im so amazed with your bento skill! ) and always inspired. WOW! 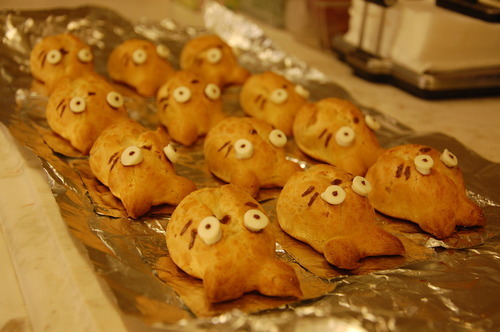 Totoro + Creampuffs! two of my greatest loves. <3 thank you so much for this tutorial! this is my first time here. can’t wait to check out your other stuff ^^ Have a nice day! Thanks for writing this recipe up! 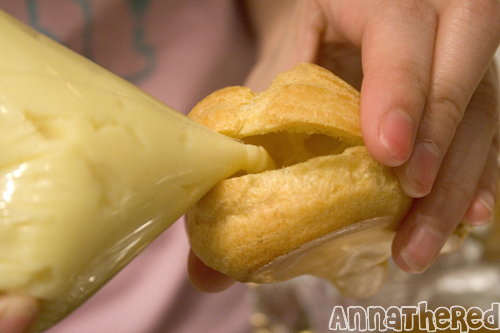 I actually tried making this tonight, and while the custard turned out yummy (I took a risk and substituted flour for strawberry pudding mix), the puffs came out flat as cookies, and slightly burnt! Maybe I put in too much egg…and maybe adding 2 tsp of pudding powder to the puff mix was a horrible idea (I was feeling a bit adventurous). 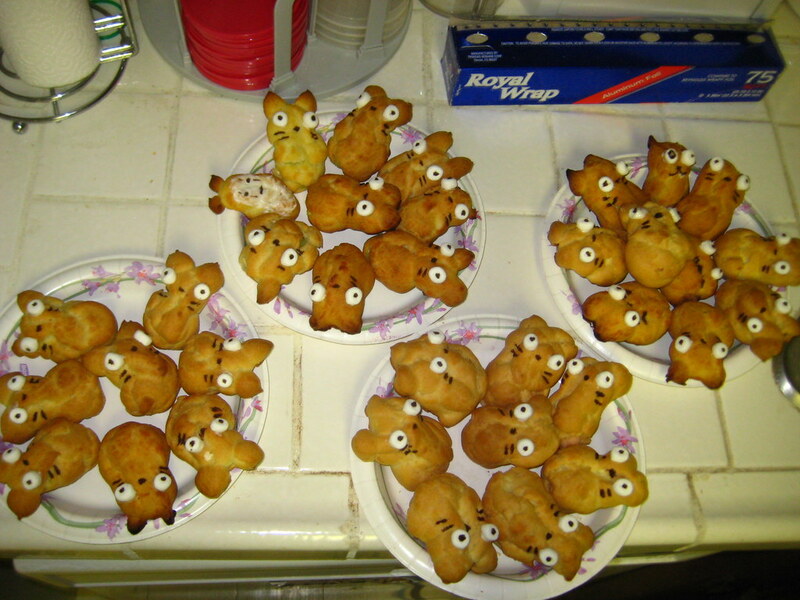 Hi Anna–this was such a genius idea, and I had to go make Totoro puffs pretty much as soon as I saw this post (okay, well I waited for the end of the work day first). Thank you for making such a detailed post (although I am apparently not very good at following directions ), and next time maybe my Totoros will not come out so deformed looking . 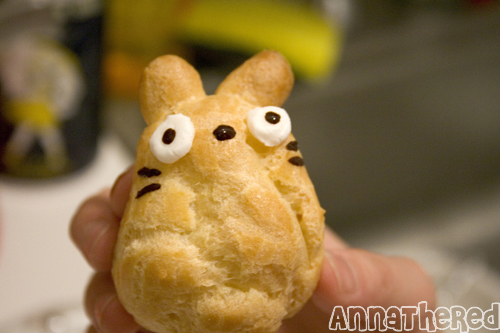 My addition was dusting with blue and white confectioner’s sugar to make chu-totoro. It was so much work to get two colors and not cover the eyes, nose, and whiskers that only the birthday boy got one. Everyone else got a bald one. Simply awesome! Thanks for the step-by-step pics! I hope your cream puffs turned out good. If your oven uses a light bulb, you can just get a light bulb for oven (it’s a specific light bulb for appliance) at any hardware store. I thought mine was just completely broken and didn’t really think of fixing it… but I just changed the bulb the other day and now it works! I have no idea what kind of oven you use, but I just thought I’d mention it. Thank you very much for your lovely puffs. Your works are so amazing!!! Would you please tell me know how thick the dough is? Re-bonjour AnnaTheRed, it’s me again. 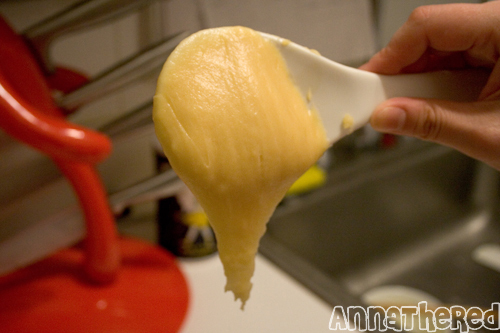 Shall I put a tea-spoon of yeast ?! Sorry to hear that your puffs didn’t come out puffed. 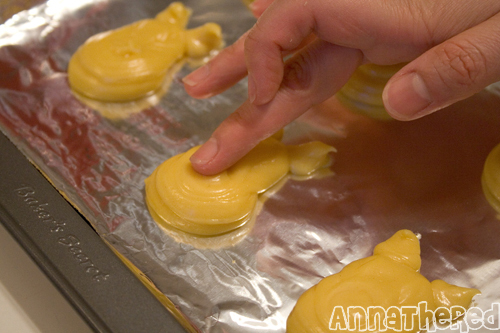 =/ When the puffs get flat, it usually means you had too much egg in it or you opened the oven too soon. 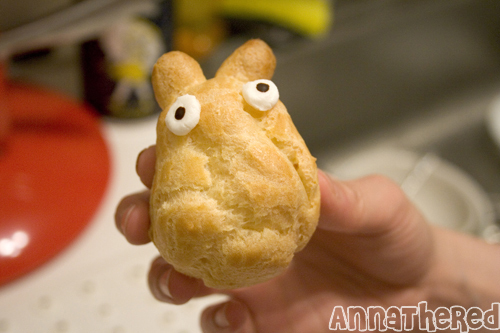 I’ve never made cream puffs with yeast, but you can use any cream puff recipe you want to make Totoro cream puffs. Don’t get discouraged and try again! Good luck and let me know how it goes. Hi, the cream puffs were great! 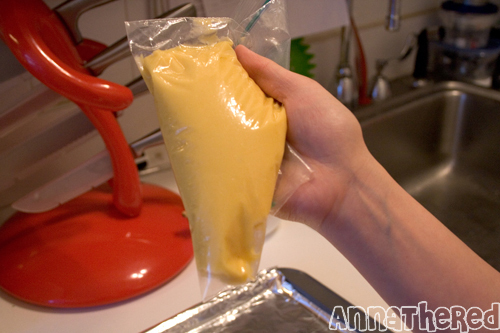 However, my friends said that the custard is a bit hard, not as soft. 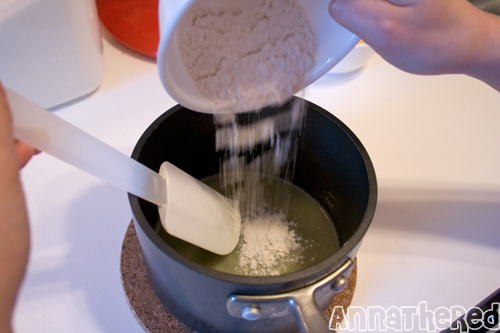 Do i pour the mixture through a sieve more times to solve this? Or do i put more milk and less whipping cream? 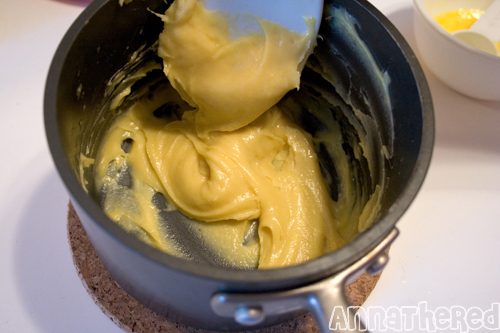 Not sure how hard the custard your friend made (it should be about the same consistency as pudding or sour cream), but did your friend make custard with the stove top? 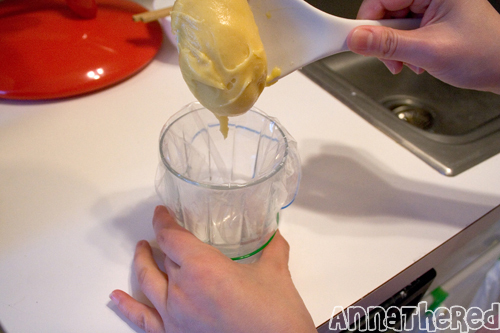 If so, maybe your friend heated the custard too much. If your friend used the microwave, maybe the temperature of the microwave was too high. By the way, did you take pictures of the cream puffs?? Email them to me if you did! I’ve always had problems w/ my cream puffs deflating (usually I’d make 2 dozens and less than half remain puffed-up while the others go flat upon being removed from the oven). 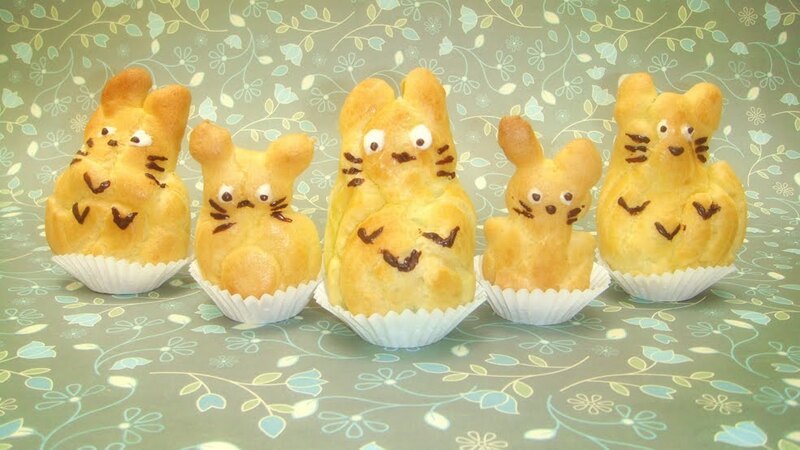 I was searching for methods to prevent deflation when I came across your site and I just fell in love with the rabbit-like cream puffs! (I’m not familiar w/ Totoro.) They’re SO adorable! 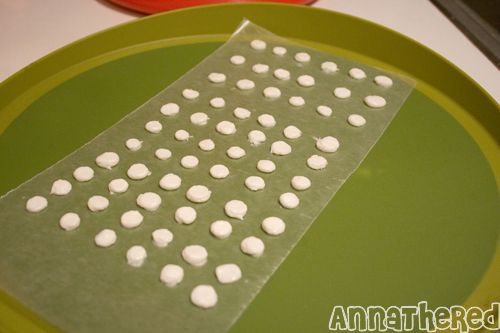 I’m going to try to make them (w/ your detailed instructions — thanks for the trouble!) w/ all the tips I’ve read on preventing deflation. So cute-looking! If I succeed in making them I probably wouldn’t have the heart to eat them! I made them here: http://theresthebeef.blogspot.com/2010/02/i-showed-you-things-that-id-made.html They were partially successful, if rushed! I’m also currently finishing off my Totoro mittens (also pictured on my blog). Hope you love them! And thank you for the recipe! 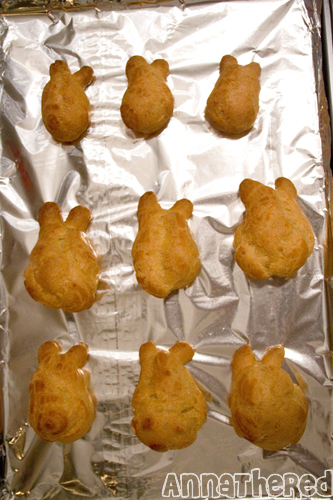 i made the creampuffs twice. 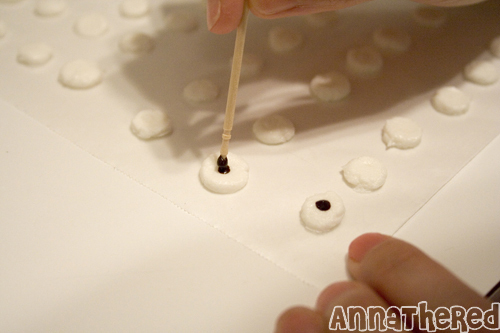 the first time there wasn’t enough dough, so the puffs came out small, burnt, and stone-like. the second time, i doubled the dough recipe and they came out great! they look sooo cute! i guess the lesson is, if at first you don’t succeed, try try again. I decided to try a batch this evening when I saw ur recipe at http://www.instructables.com. this afternoon. 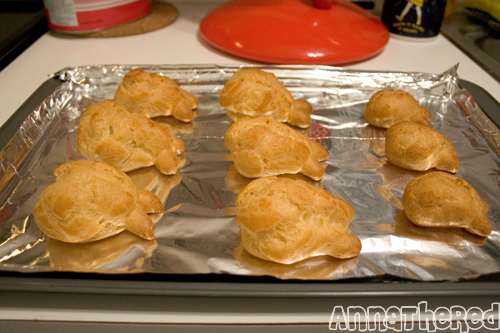 I tried making these cream puffs but my dough was to thin even though I added two eggs in it. I’m not sure what I did wrong. Sorry for the late reply! 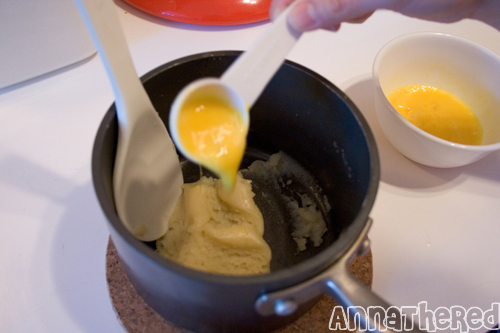 The size of eggs vary, and the amount of egg affects the thickness of dough in this recipe. So you need to add the eggs to the dough bit by bit and keep checking the texture as you add a TBS of beaten egg at a time. It’s ready when the dough is thin enough that when you scoop the dough up, a lump falls after 3~5 seconds and makes a triangle shape from the spatula. 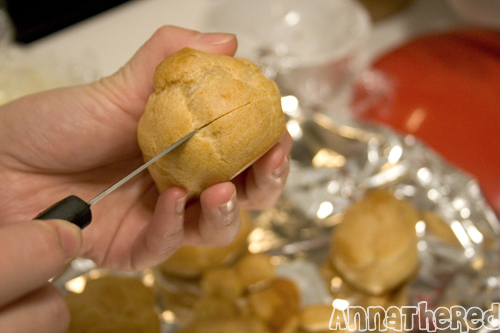 I’ve always used this recipe but there are a lot of simpler recipes for cream puff dough, so if mine doesn’t work out for you, try some other cream puff recipes! i just made these and my kid ate them without even bother to let them cool down . 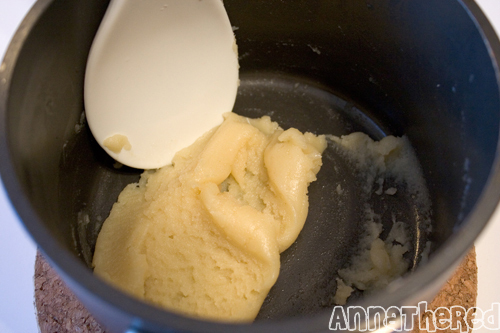 Unfortunately, you cannot bake cream puffs in a microwave. You have to use a conventional oven to bake them. In some foreign countries, such as Japan, they have a microwave which also can “bake” but I don’t think they sell them in the U.S. Good luck! Hi Anna! I love totoro so much! i am so going to try this. 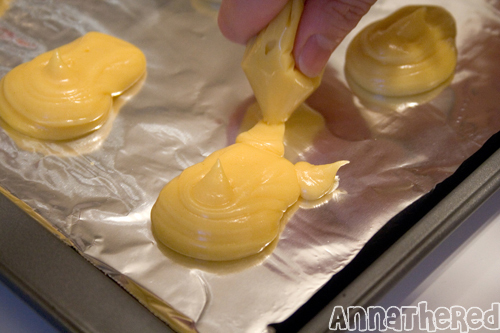 would it be wierd if i used custard for the eyes instead of white chocolate? 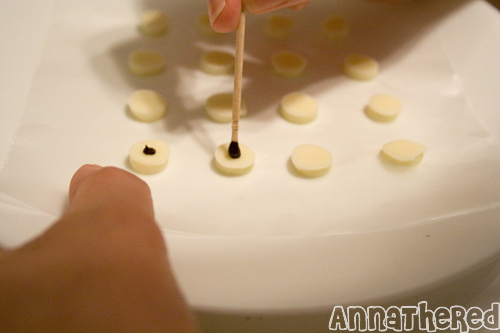 its hard to find white chocolate (nevermind white chocolat chips!) in korea which is where i live. For some reason, I only need to use one small egg instead of two large eggs. Does it differ by that much, or could I possibly be doing this incorrectly? Also, my dough comes out a lot lighter than yours. Which makes me think it might be the butter. 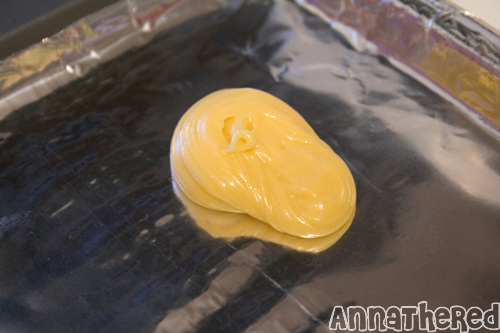 What type/brand of butter do you use? Sorry for the late reply! Egg size differs so it’s best to go with the texture. In other words, try adding beaten eggs little by little. As for the color of the dough, it could be just under-baked but I’m not very sure. I used generic unsalted butter. Hope this helps! You did an amazing job! I saw the ones they make in Shiro Hige in Tokyo and they seem to be a bit bigger. 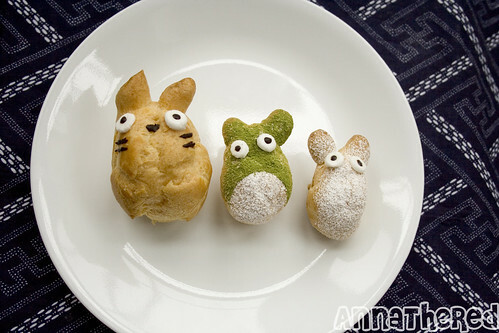 Is it possible for you to blog or let me know how they make the ears for the Totoro for those? The ones you made in this post are resting on the sheet whereas the ones that are bigger are not, if you know what I mean. I am wondering if the ears will fall out. I hope this is not confusing for you. 15 Unique Easter Recipes That Are Actually A Breeze To Prepare | Hype Seek ! !